It's really easy to set this up. There are just three steps required. Jump onto the web site, login and go to your account settings. One of the options is "Mobile" where you can set your options for how you'd like Teamstuff to send reminders and messages to you. In the example above, we have flicked the option from Push to Text Messages, and now we are registering our mobile number. To do so, choose the country and set your mobile number. 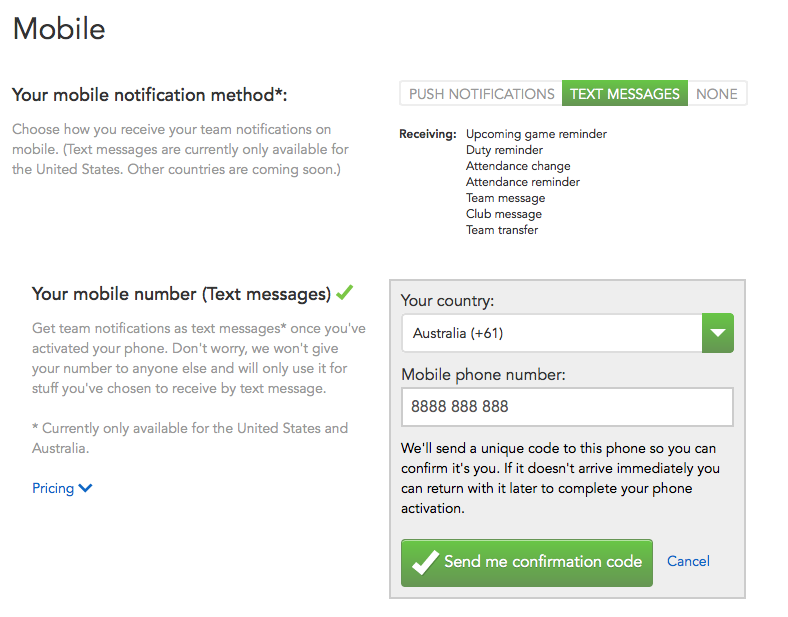 We will send you a special code in the next 30 seconds or so - which you type back into teamstuff to verify your mobile. OK - great - that's the first part done. The next step is to buy a bundle of text messages - you can purchase them in various sizes at various prices. We're trying hard to keep teamstuff free - but it costs us real money to send text messages, and the price varies significantly by country. For example - it's about 10 times more expensive to send a text message in Australia than the United States. So we ask that those users who really need them ( e.g. Windows phone users, or those without a smart phone ) to purchase the text messages. We use stripe.com as our payments partner - and one of the best parts of that is that teamstuff never handles credit card information - it's all done with stripe. OK - last step - just jump over to the Notifications in your account settings, and now you can personalise what notifications you want - and when you get them.